Jack was greeted by the Prime Minister of Jordan Omar Al Razzaz upon arrival as he supports Jack’s excellent work and dedication to the region. 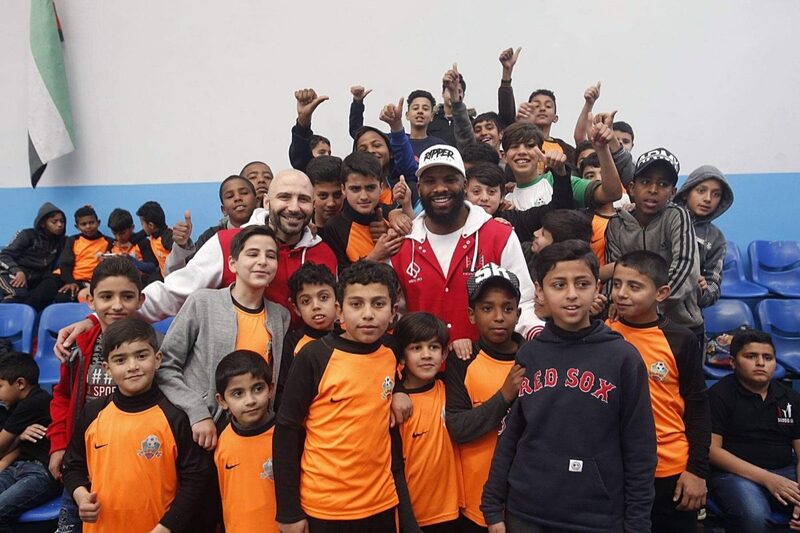 During the visit to the camp, Jack officially launched the Badou Jack Education Center – a state of the art facility to that will hold extracurricular activities for the children as well as teach computer skills, language and literacy. As part of his commitment to the camp, Jack is personally dedicated to watching over 15 orphans. This includes meals, clothes and additional expenses. The Badou Jack Foundation will offer them computer, technology and language education to help them with essential tools to help build their futures. He is also working closely with the camp to sponsor the education of a boy with cerebral palsy. Sixteen-year-old Ayoob, who has had four surgeries, is completely illiterate as no school in the area would take him in, therefore Jack will be funding a special educator to teach him how to read as well as equip the camp to be handicap compatible. This is all made possible by Jack himself as well as the funds raised through the Badou Jack Foundation. But it doesn’t stop there. Jack’s nutrition line, Ripper Nutrition, is launching a nutrition bar that will directly benefit the refugee children. For every bar sold, a shake will be provided for the kids in the camp that will be packed with micro and macro nutrients, vitamins and minerals. Studies show that three out of five children in refugee camps are severely malnourished. Two-division world champion and philanthropist Badou Jack has officially launched Badou Jack Promotions and Events LLC in the United Arab Emirates, as he continues to grow his portfolio of ventures outside of the ring. Badou Jack Promotions will hold their inaugural event on Friday, May 3 from the Five Palms Jumeriah in Dubai. “Five Palm Jumeirah Dubai is excited to partner with Badou Jack Promotions to deliver an unforgettable evening of excitement and entertainment on May 3,” said Aloki Batra, CEO Five Hospitality. Adding to his sports supplement company Ripper Nutrition and non-profit organization the Badou Jack Foundation, Jack’s promotional company is another aspect of his burgeoning enterprise. Jack has been in the Middle East since his fight in January, doing charitable missions while also exploring entrepreneurial opportunities in the region that he has frequented throughout recent years. With the May 3 date set, and bigger events in the works for the future, Jack is on his way to bolstering his business credentials with this new company, while also providing unique viewing experiences for the people in the UAE.